The new Butlers Bingo site is brought to you by the suave and sophisticated ‘Butler’ who likes nothing more than playing bingo when he’s not busy serving his Master. The site is powered by Microgaming, one of the big names in the online bingo business who are also behind Giggle Bingo site. The home page is decorated in shades of gold and purple and looks very glam. The Butler makes life nice and easy for you by allowing instantaneous game play as there’s no software to download to start playing. You will have to create and account to begin your bingo playing but this is very straightforward stuff. You will be asked for your e-mail address, your name and a password followed by your date of birth and address. Once you’ve submitted this info you’ll be asked to choose a username and confirm your details and you’re done. There are a number of ways you can fund your Butlers Bingo account, these include: Moneybookers, Ukash, Solo, Switch, Maestro, Visa Electron, Delta, Mastercard and Visa. The minimum transaction amount is £10 and your first deposit will be met by a 300% bonus and there’s even 25% on all of your reloads. The bingo lobby offers both 75 ball and 90 ball bingo and has three main bingo rooms: Friendship, Sunshine and Harmony. Ticket prices start at a very reasonable 5p and the lobby tells you everything you need to know about each room before you enter so you’ll know how many players there are, the jackpot, Progressive Jackpot and when the next game is due to start. The lobby also gives you access to slots, scratchcards and casino games. There are over 40 slot games, 30 scratchcards and 27 casino games including Keno and Roulette. Butlers Bingo really is a fantastic site, it looks good and there are lots of games to play with some pretty impressive prizes and PJPs. The Chat Hosts and Support Team are really good at what they do offering a confident and professional service. The site has a really good family feel to it and it’s very easy to make friends in the chat rooms which seem to be occupied even in the middle of the night. The bingo rooms are every bit as luxurious as the rest of the Butlers Bingo site and there’s more gold and deep purple adorning the screen. You can see what the one line, two line and Full House prize is, how much tickets cost and how many roomies are in the room so everything you need to know is there. The bingo calling is traditional with all the bingo lingo diehard bingo heads like to hear, it’s also pretty fast so you won’t be waiting around. There’s a busy and extremely friendly chat room you can have a natter in and the CH will help you settle in if you’re a little shy. Make the CH your first port of call if you have any problems, they are very helpful and really know what they are talking about. When playing bingo you can also access over 30 side games so if you like to play other games alongside your bingo you’ve got a good selection to choose from. If you get stuck and need some help at any stage you need to ‘Ask Astrid’ she’s the Butler’s side kick and is on hand to answer any of your problems. You can e-mail Astrid or browse the FAQs page. If you want an instant answer try the CH as they are pretty knowledgeable and super friendly. There are loads of promotions to keep you busy at Butlers Bingo and these are updated on a regular basis so check out the promos page for the Butler’s latest hot offers. You can also follow Butlers Bingo on Facebook and Twitter where you’ll find out all the latest news before anybody else. Butlers Bingo is not part of a network. No, you are not required to download this bingo game, there is an instant play version at Butlers Bingo. 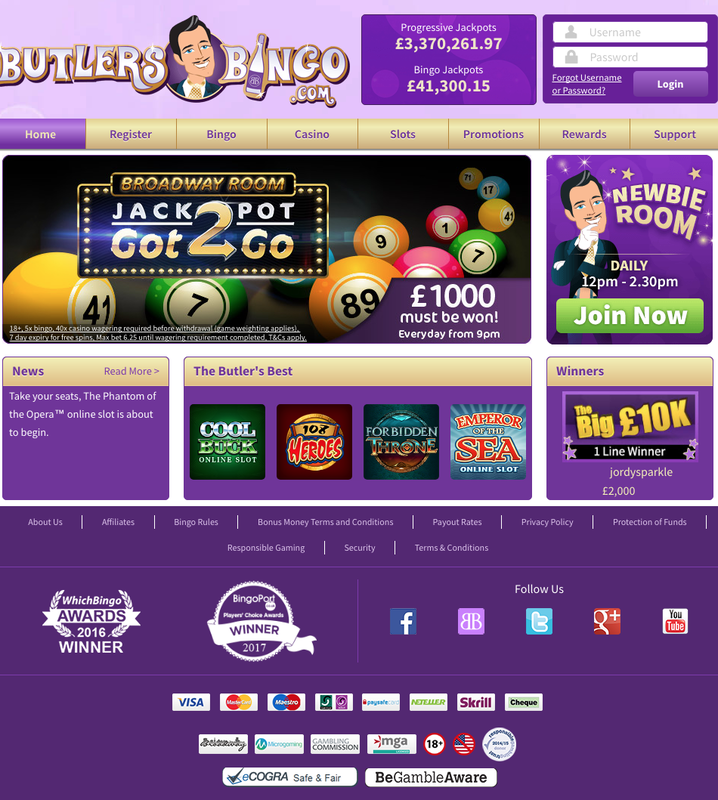 No, Butlers Bingo does not offer a downloadable version but you can play instantly on the site.